The first international automobile road race needed an extraordinary symbol of its significance. 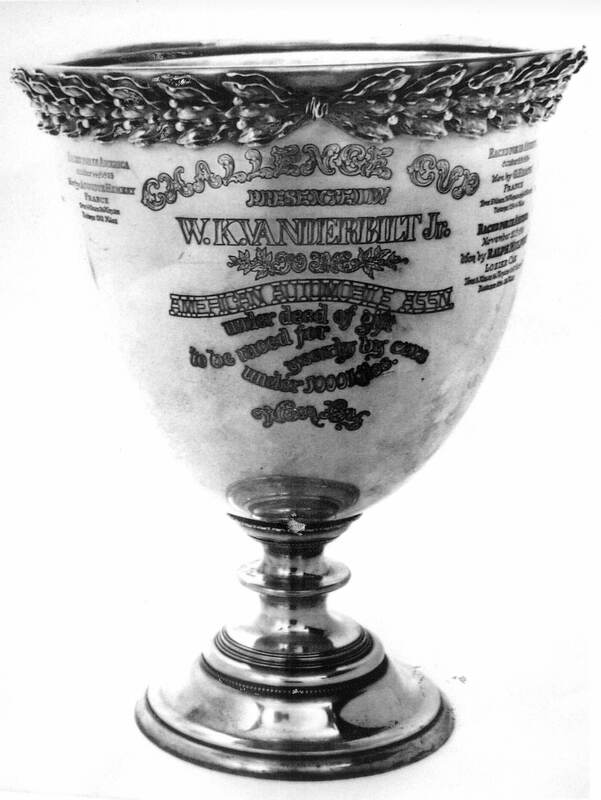 The $2,500 Vanderbilt Cup, designed by Tiffany & Company, filled the bill. 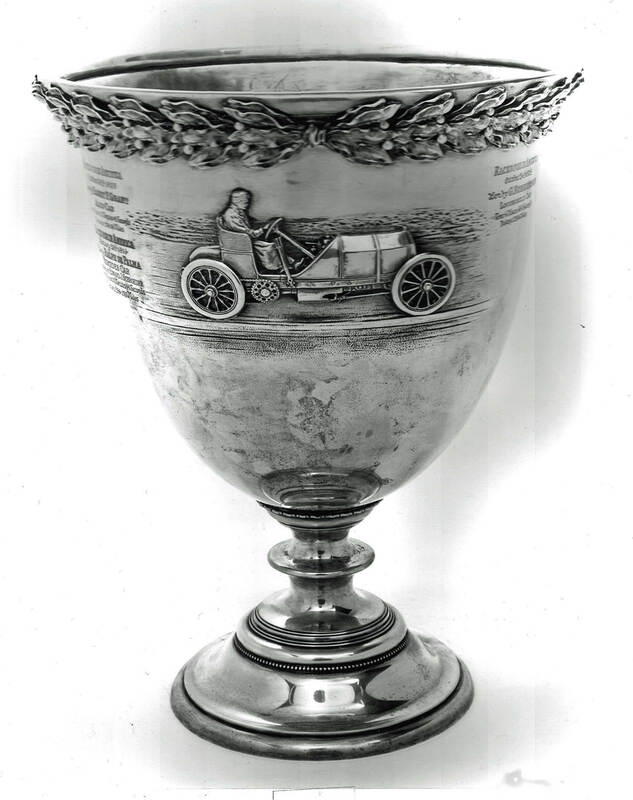 After weeks of discussions, Vanderbilt felt confident enough the race would become a reality that he ordered designs for the trophy from Tiffany’s in March 1904. Here is a close-up of the trophy using photos taken by Walter McCarthy when the Cup was last seen on Long Island in 2002 when it was on loan from the Smithsonian Institution. As described by A.R. Pardington, “The trophy is classical in form and massive in size, with simple decorations that help to accentuate the strong lines of this superb piece of silversmithing. 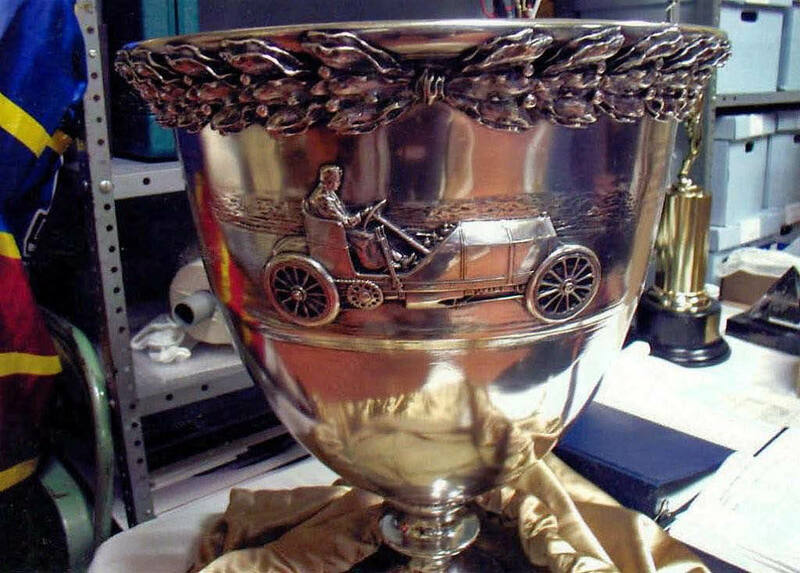 The shape of the Cup was suggested by some of the unique and beautiful vessels found among the silver treasures of Boscoreale (an ancient Italian city and site of an archeological dig) which date back to 79 A.D."
A fine portrait of William K. Vanderbilt Jr. in his 90 horsepower Mercedes at Ormond Beach is worked up in bold relief on the front of the Cup. It celebrates Willie K's greatest personal racing accomplishment of breaking the one-mile land speed record on January 27, 1904 going 92.3 mph. Including the wooden base, the Cup stands about 31 inches. The bowl contains 481 ounces of sterling silver and has a capacity of over ten and a half gallons. The winners of the 9 William K. Vanderbilt Jr. 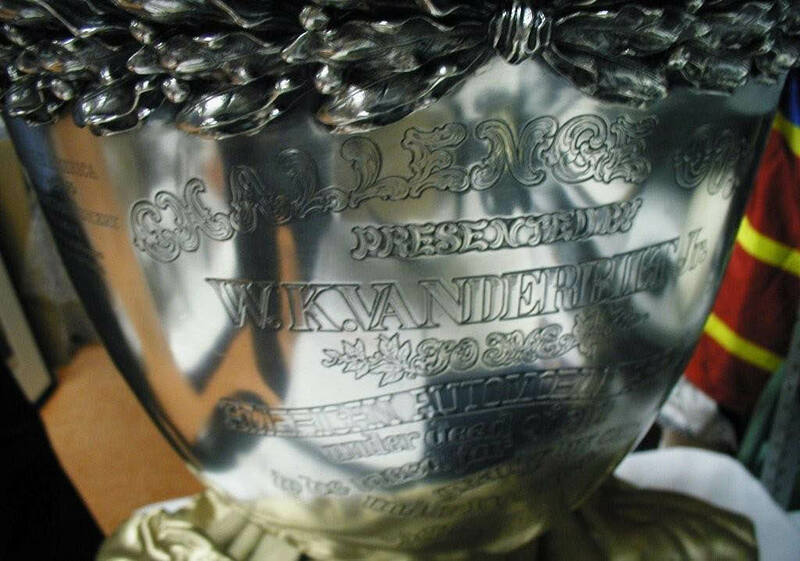 Races (1904-1914) are engraved on both sides of the inscription. The 9 engravings indicate the location of the race (always in America), the race date, the winning driver, the country of the winning manufacturer, the overall winning time and total distance. 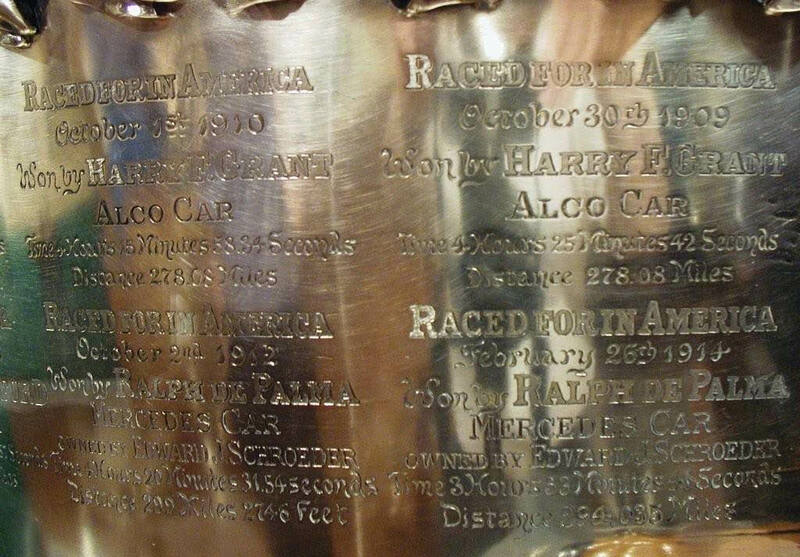 For some unknown reason, the 1915 and 1916 races were never engraved on the Cup. 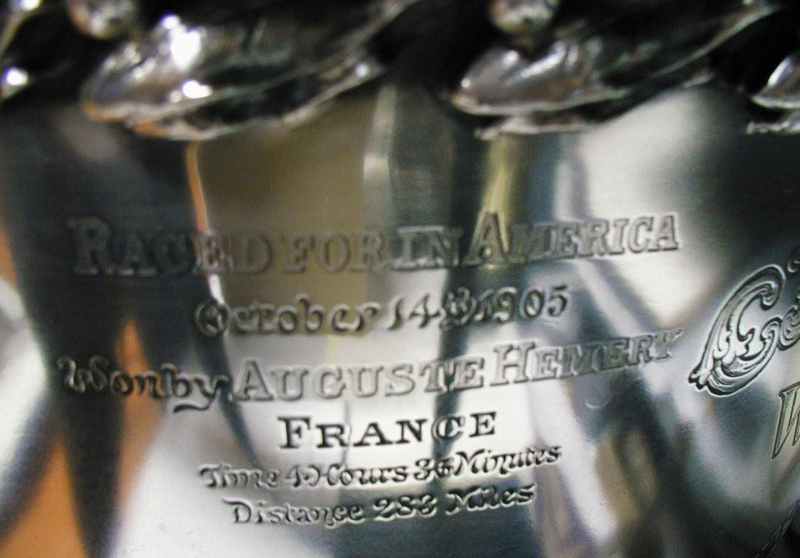 What a big surprise to see the erroneous first name engraved on the cup for Hémery! It’s a funny point of the history that I didn’t know! Thanks a lot! What a beautiful work of art. Thank you for sharing. Happy Holidays to you and your family! Willie K’s land speed record. Who has the contact at the Smithsonian ?? Let me know and I will give it my best effort to make it happen. I totally agree. Please call me at 1-516-625-0123 and we can discuss next steps.